See photos of World’s only Veteran Aircraft of 3 wars, built 75 years ago, and still in active military service. 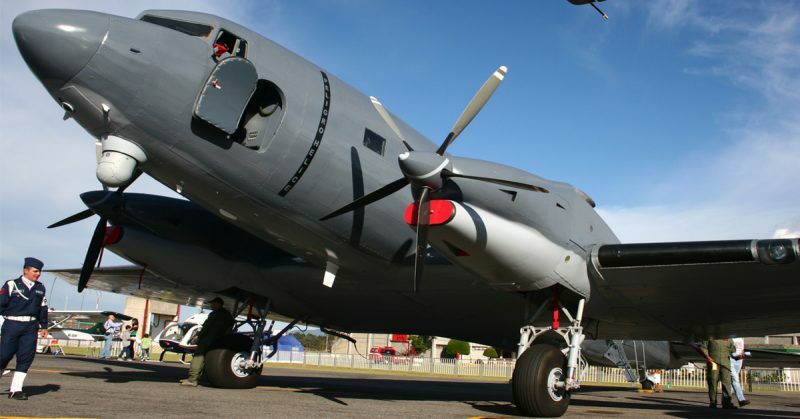 The AC-47 T Fantasma, using the very same airframe as the iconic Vietnam War Aerial Manhunters based on the C-47, often dubbed “Spooky” or “Puff the Magic Dragon”. Photo above depicts the AC-47 T Fantasma, a night prowler using the WW II built C-47 air frame, modified with turbo engines and a couple of very lethal barrels protruding from the windows. It may not look all too impressive, but in this layout, the aircraft has pounded the FARC jungle camps by night to such extend that FARC almost disintegrated in a matter of 3 years of attacks with those “Bats out of Hell” and other specialized aircraft. The Rebel camps were hard to find in the dense jungle and mountains, until the InfraRed Camera arrived, coupled to those sideways firing guns. This photos above depict unmistakably the silhouette of the Douglas DC-3/ C-47/ Dakota, a vintage aircraft of which the last one was built in 1946, 70+ years ago. That legendary aircraft (aka The Gooney Bird) made its maiden flight on December 17th, 1935, now exactly 80 years ago. In the 10 years of its production, this DC-3 in various models would forever change the World, and the 10.600 + aircraft built in all its versions in the USA were to become the most enduring and operationally longest lasting aircraft ever constructed in the 100+ years of Aviation History. The Douglas DC-3 entered the Hall of Fame already long before WWII, responsible in 1940 for over 70 % of all North American Passenger Air Transport. But the real “Days of Eternal Glory” came during the War that took place for the USA from December 1941 until August 1945. Its heroic role as a Utility/ Cargo/ Paratrooper/ Medevac transport in all theaters of War will never ever fade from public memory. Both at the Normandy Invasion and in the Far East, flying over the Hump, its reputation as a most reliable and versatile platform for air transport was settled forever in the War History books. After 1945, there came the Berlin Airlift (1948), the Korean Conflict (1950-53) and the Vietnam War (1964-1975). In all those conflict areas, the Skytrain/ Skytrooper/ C-47/ C-117/R4D was there for help, hauling food, fuel, beer, ammo, Jeeps, Howitzers, Generals, Soldiers, Paratroopers, the wounded and the fugitives. After those wars, the aircraft soldiered on, both in the Military Role and with Civilian Operators. he Caribbean, Alaska, the Yukon, Northern Canada, Africa, and South America are now part of the last realm of the DC-3 where until today still some 150/200 airworthy aircraft of the type can survive. But what many people do not know is that there existed already in 1964 an outrageous version of the peaceful Douglas transport. 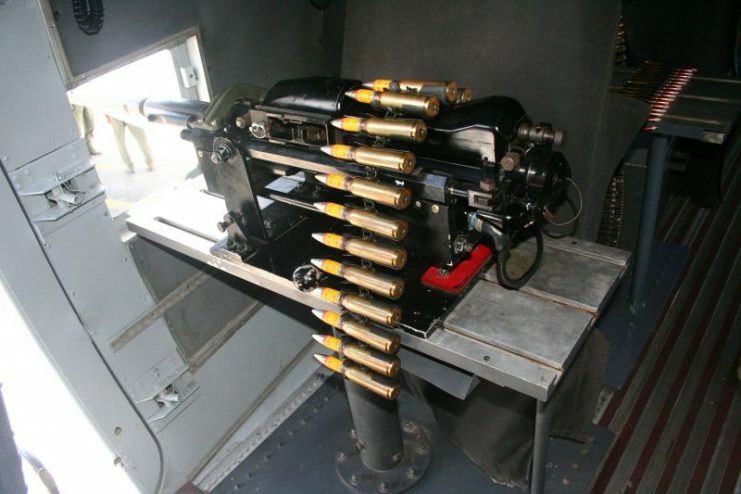 It was armed with 3 side wards firing Mini guns of the Gatling type, with 6 rotating barrels per gun. The vintage C-47 Transport came out of the blue into an Attack role and got the prefix A (Attack) as AC-47. This veteran wasp soon turned out to be a most effective deterrent in its role as a Close Air Support gunship in Vietnam. With the Viet Cong staging ambushes from paddy fields, villages and jungles, the help of the overhead flying “Ammo Hailstorm”-inducing aircraft became legendary, and soon these planes were honored with the nicknames “Puff the Magic Dragon” and “Spooky”. Photo supplied by my contact, an ex-Commanding Officer and Fantasma pilot. This pic was taken in Eastern Colombia near the Orinoco river in Puerto Inirida, a supply airstrip where Fuel and Ammo were taken just prior to the hunt for drugs and weapons smugglers that try to cross that river which is also the border with Venezuela. The leftist Government in Venezuela is since long (already under previous President Chavez) a suspect in giving stealthy support to the FARC with cross-border refuge, weapons supply, and smuggling, all sorts of activities undermining the Colombian Government/ Army. 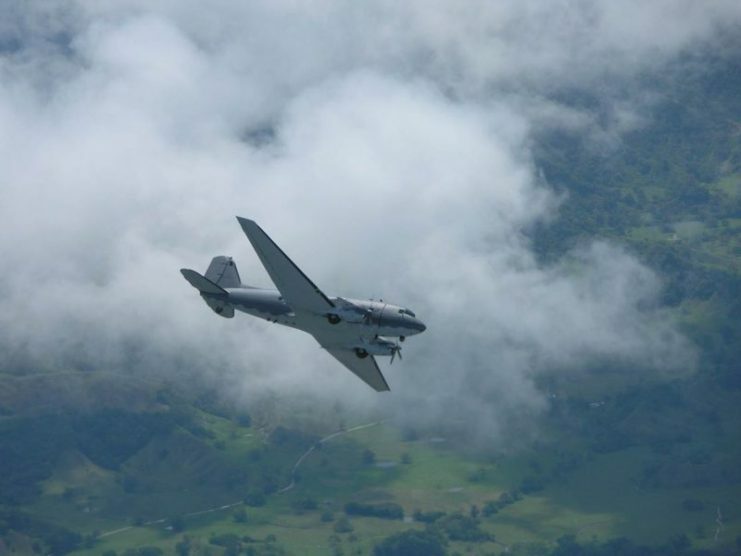 The days of the AC-47 Spooky Gunship lasted for long, even in 2015, they were still flying on patrols over Colombia. That South American nation has a reputation for its production, trade, and smuggling of Cocaine and Marijuana. The illicit business made the local Drugs Lords as Pablo Escobar rich and famous. They were hunted down with help of US intelligence, but their annihilation left a vacuum that soon was to be filled by another Drugs Dealer with more endurance and a couple of foreign investors. That was FARC, the long existing leftist Guerrilla group, that smelled their chances with the extradition of the Drug Lords. You should read my book The Dakota Hunter, which gives you a detailed insight into how FARC operated and what the Colombian Government did with US help to exterminate this plague. That is a most intriguing story, described in my book’s Colombian travel report as I ran into the War-on-Drugs in October 2006, re-visiting the country after so many war years. My encounters with DEA agents were rather awkward. Flying into the Amazon Jungle with the DC-3 was surely not their favorite trip and they declared it a No-Go Area for me. Against all odds and advice, I went down south to Villavicencio, where a growing threat was felt with serious warnings from the Military and Civilians for kidnapping by Rebels: As a conspicuous “extranjero” with my blond-chestnut hair, they advised me to never stay longer than 1-2 days on one single location. Photo: The Colombians had/ have 5 AC-47 T’s Fantasmas ( Spanish for Spooky) as you see in the pictures above, overflying that typical Colombian landscape that I met South of Villavicencio. Mountains with dense jungle, broken by the endless pastures used by cattle ranches. But also most fertile soil for growing illicit crops and hide-outs galore, until the AC-47 T Fantasma came flying overhead with an InfraRed camera under its nose. End of an era for FARC. But new hunting grounds for the Fantasma showed up, the coastal surveillance in the North of Colombia where (semi-) submarines were constructed for the coke transport to Mexico and USA. The “underground” assembly of the Drugs Subs takes or took often place in hidden lagoons and overgrown river banks of the sparsely populated North -East of the country. Not easy to detect from the air or from the sea, until that camera ship flies overhead and picks up the heat silhouettes of humans or engines. With the BT-67 model, much stronger engines (PT6A-67R Turbo Props) are installed with 5 -blade Props, and a load of modifications follows from there. First the payload: The original C-47 payload of 3 tons goes up to 5 tons. 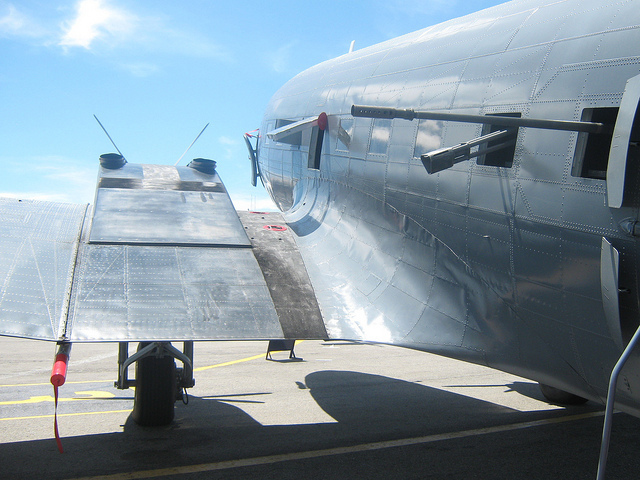 For that you need more space, so the fuselage was stretched right behind the cockpit with some 7 inches (similar to the Super DC-3, or C-117D). It makes the nose of the aircraft standing markedly higher up when the plane is parked. Most important, the aircraft has a higher cruising speed and better-streamlined nacelles, the main wing with modified wingtips and flush riveting, also resulting in less drag. Photo above depicts the rapid-firing cannon with the ammo feeder box right behind her. Aiming of the firing is not executed on a swiveling base but by the pilot’s steering with banking and tight turning of the total aircraft over its left side, creating an inverted ‘cone’ of fire. The tracers are the proof of hitting the target and any suspicious InfraRed-detected silhouette that tries to escape from all that Hellfire coming from the skies is monitored on the camera-goggles and adjustments of the aircraft’s roll rate and direction will be made in order to stop any evasive action of the bandits. The lethal Attack nature of this remarkable 3-wars veteran lies inside the aircraft. First, there is the radome under the cockpit, this is the FLIR camera (Foward Looking InfraRed), the night detecting device of all human activities (Body heat, cars, and boats with warm engines, jungle labs, living spaces, generators etc.). This is the crux of the Killer machine, to first hunt its prey at night: once detected, there come in the guns to finish the job of “Detect and Exterminate”. The 3-barrel machine gun and the rapid-fire cannon (see photo above), with a presence of tons of ammo, are handy with that capacity to loiter for a couple of hours over the Rebel camp, it all make this a very efficient and much-feared “Killer Bat”. This Hi-Tech hunting system is all packed in a 70+ years old aircraft platform that was designed in the early 1930s and produced in the 1940s, this is a most remarkable feat for which we can have only admiration and respect. FARC must have underestimated the fire-power and reach of this unique combat machine. In their heydays between 2000-2007, FARC took refuge in Ecuador just over the border in a jungle camp and felt safe from the nocturnal attacks. That seemed comfortable until one day, Colombia’s President Uribe, along with US help, decided to make a night-assault on that hidden FARC “Holiday Resort” camp. In a couple of hours, it was all done, their camp rather intact but all 24 guerrillas killed, including the Rebel Force nr 2, El Comandante Raoul Reyes. In my book, you can see more photos of the AC-47 T and read about the ensuing James Bond-like actions that Colombian Special Forces executed with help of DEA. The latter executed a secret mission in Thailand and brought FARC almost on its knees. Read also what Washington Post revealed in 2014 about the secret US support for that Ecuador intervention. Ever since that attack in 2007, there is great respect for the vintage C-47’s Fantasmas and their crews. The rebels faced massive drain and desertion of their soldiers due to the devastating night-attacks and “no more place to hide”. The arrival of the “Airborne Posse” in the region soon spread out its reputation with an imminent “Kill ’em All”/ No Escape assault! All honest population stayed inside their Villages, all men outside at night were a direct target! 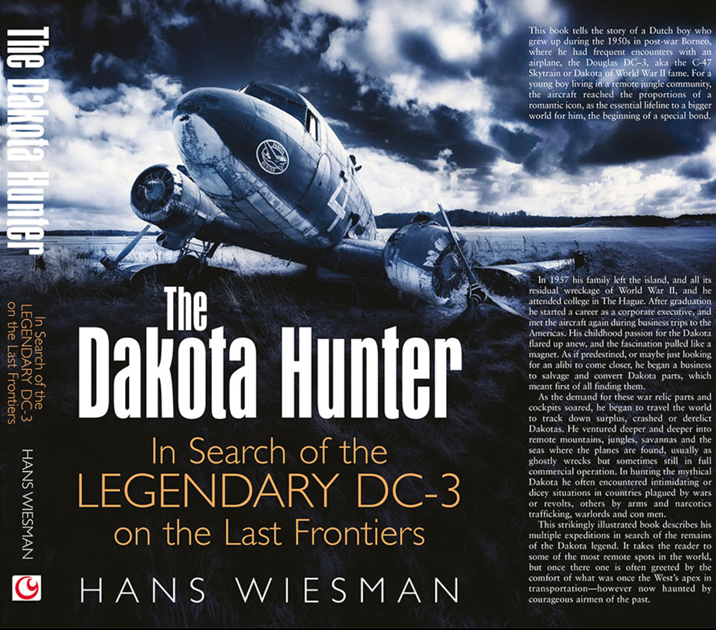 As a tribute to this aircraft, I have written the book The Dakota Hunter (Casemate Publishers USA/UK) telling about my 25 years search of the Legendary DC-3 on the last frontiers. Crashed, abandoned or still flying, I found them and often in very fascinating or outright adventurous circumstances that were worth being written down in 320 pages. The 250 photos in my book (most of them taken during my multiple expeditions to faraway places), are evidence of what I have seen and experienced, with the pilots, the operators but also with the Military, the War & Drug Lords that often were hanging around this aircraft for obvious reasons of being the sole air transport that could land on remote Jungle strips. No plane in the world that is so cheap to acquire for hauling 3 tons of Cargo and so rugged that it can virtually land on every patch of savanna land, a sandy beach or a muddy river bank, due to its low approach speed and big Balloon tires. Such features are most welcome, especially when you are in an illegal trade and want to operate under the radar of the Armies, DEA, and other party poopers. 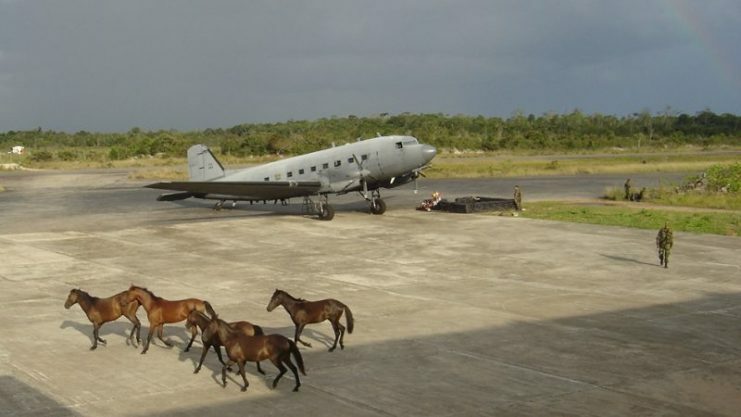 But by now, even in Colombia, all civilian DC-3s flying there are now back in the booming and straightforward business of hauling passengers and cargo into the remote wilderness of the Amazon Jungle, that opened up after the demise of FARC. 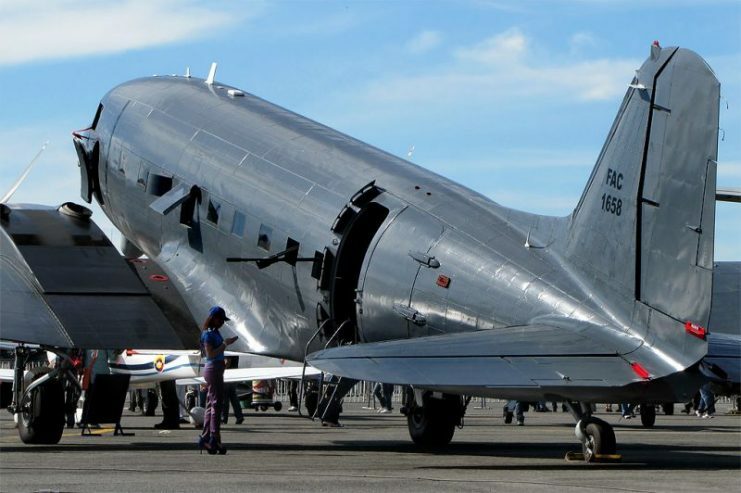 The DC-3 is here to survive for many more years! Check out my books, they are the perfect Christmas Gifts for your (Grand-) Dad, your Family or Friend, or just for yourself! See the Reviews and order links here below. For more info, blogs, reviews and how to order the book at Amazon, Barnes & Noble etc, come to my website www.dc3dakotahunter.com or go to Order the book directly at Amazon.